Making a silicone matrix to fabricate provisional has several goals and they include accurate replication of the model being used to form the matrix and efficiency in fabricating the provisional. One of the most time-consuming components of fabricating a provisional is trimming the excess material away from the margins and embrasures.Recently I learned an addition to my silicone matrix technique that is no doubt my new favorite trick. The technique is designed to fabricate a silicone matrix for use with “shrink wrap” provisional where they are intentionally locked on. In this technique as all the trimming is completed in the mouth it is critical to reduce the excess both for purposed of time as well as reducing he risk of damaging preps during intraoral trimming of the bisacryl. A stone model of either the original teeth if you are copying them or a wax up will be used to fabricate the silicone matrix. With a cleoid discoid carver scribe a .5-1mm deep channel around the gingival margins of all of the teeth that will be prepared. 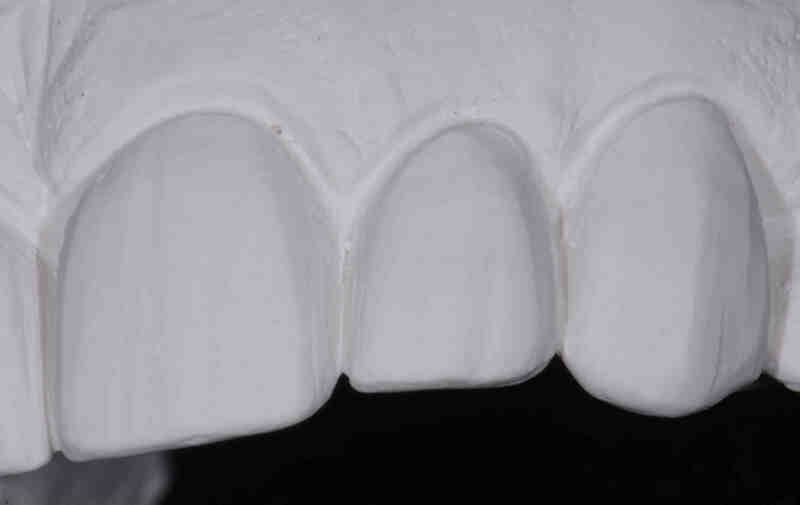 If you are planning veneers you will only need to scribe the channel on the labial, for full coverage do the lingual also, Next using the same cleoid discoid carve away the top .5-1mm of the gingival tissue beyond the channel you scribed. Lastly, carve out as much of the stone in the interproximal embrasures on both buccal and lingual of the model as you can. Avoid creating a connection between buccal and lingual, so leave some stone in the center of the embrasure areas. 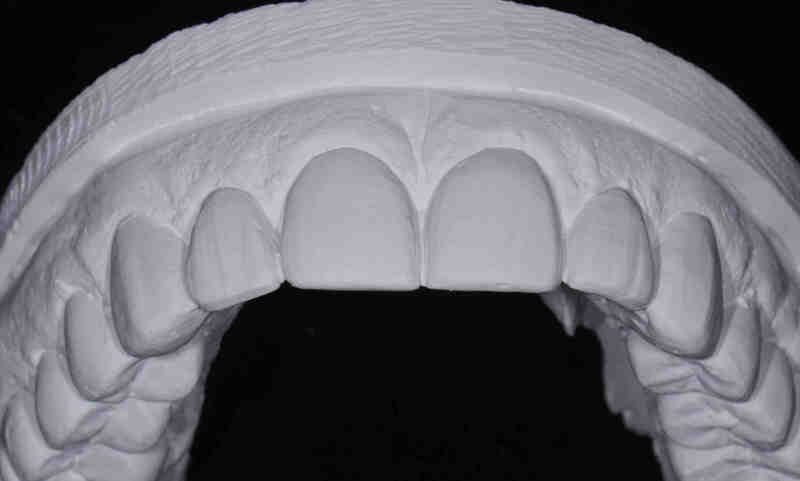 With the model trimmed fabricate a full arch silicone matrix using your preference of material. Once the matrix is set, reline it on the same altered model using light body VPS impression material. The last step is to trim the excess silicone material being careful not to cut off the silicone that adapted into the channel you cut on the model and the space where you removed the stone gingival cuff. The Silicone and VPS that flowed into the channel you cut in the model, against the tooth forms where you trimmed away the gingiva and into the embrasures places pressure against the prepared teeth when forming the provisional and dramatically improves adaptation and reduces excess material that needs to be trimmed away. After publishing this post I learned that this technique is thanks to Dr. Todd Snyder, published in PPAD May/June 2009 “Bead Line Veneer Provisional Restorations”. Thanks Dr. Snyder for a great technique! I am going to try this. Thanks, Lee. 1. In the “shrink wrap” technique that is discussed here and in Dr. Snyder’s article, is there any spot etch or bonding agent placed? Or do the provisionals stay on strictly from the bis-acyrlic shrinking and locking into place? 2. You have previously discussed your love for indirect fabrication of provisionals (taking an alginate of the prepped teeth and creating a silicone model made from Mach II die silicone and bite registration silicone) and allowing the bis-acrylic to set up and be polished out side of the mouth. When do you decide to do this indirect technique vs the new shrink wrap technique? 3. Dr. Snyder talks about placing chlorhexidine directly on the teeth prior to provisionals and you have suggested the Chlorhexidine Varnish after provisionals are completed. Because the 90 days releasing potential of the varnish that seems more beneficial, but would there be any benefit/reason to applying directly to the tooth as well?